Originally from Meridian, MS, Dr. Jackson attended Missis­sippi State University where he was a four-year letterman in baseball with the Bulldogs and lead MSU to back-to-back College World Series in 1997 and 1998. After completing an Internal Medicine Residency, he served an additional year as Chief Resident of Internal medicine before completing a dermatology residency at the University of Alabama in Birmingham. Dr. Jackson has served on the faculty since 2013. 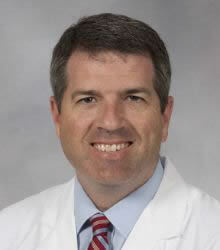 His subspecialty interests are hospitalist dermatology, complex medical dermatology, and cutaneous lymphoma. He serves a Director of Clinics in the Department of Dermatology.